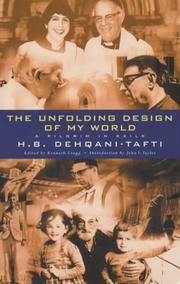 1 edition of The Unfolding Design of My World found in the catalog. Add another edition? Are you sure you want to remove The Unfolding Design of My World from your list? Published December 31, 2000 by Canterbury Press Norwich in Norwich, Norfolk, United Kingdom . 9 Watchman: What of the Night? March 24, 2017 Edited by Todays Martyrs Reviewer Edited without comment. November 21, 2016 Edited by Todays Martyrs Reviewer Edited without comment.